Test Driving - Inhibitif Advanced Hair-Free Face Serum! 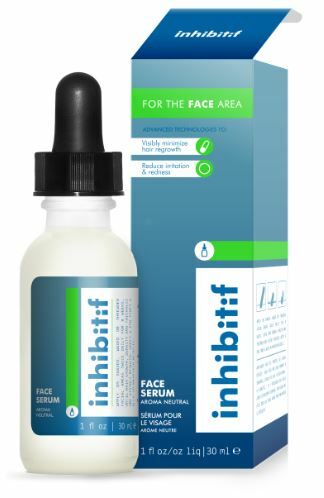 Inhibitif Advanced Hair-Free Face Serum - 30ml - $24.99 - brings its unique and effective hair inhibiting technology to a face friendly formula to reduce the prominence and density of facial hair. When used twice a day for 8 weeks density and thickness are visibly reduced and then you just need to apply every other day to maintain smooth results. Knowing that I'm a total loser when it comes to testing products that depend on regular use for optimal results, I recruited a few ladies of varying ages and facial hair concerns for a broader idea of what this stuff will (or won't) do! Angie - 23 - medium toned skin with noticeable facial hair - I have been using Inhibitif on my upper lip, chin and uni-brow and am very impressed that there is almost no hair growing back in the areas that I've been applying it to for the past 8 weeks. Toni - 44 - olive skin with dark facial hair - along with my Italian heritage comes the stereotypical lady-stache. It's been the bane of my existence since I was 13 and it has not improved with age. I have been scared to get it lasered so Inhibitif sounded like a good alternative and while it hasn't gotten rid of it entirely, there is now a lot less hair and it's finer - will definitely keep using! Meg - 30 - light skin with light but thick facial hair - I have a line of pretty thick hair that goes from my sideburns down to my chin, if I dyed it dark, it would look like one of those strange contour beards that alternative guys wear. Up to now I have either had it waxed or used a depilatory cream but both methods make me break out and/or get bad ingrown hairs so I was happy to discover that after using Inhibitif for 7 weeks twice a day that now it is just a light sprinkling of hairs instead of a full on beard! Lisamarie - so very young - fair skin with light, but annoying peach fuzz on upper lip and jaw line - so my experience to share comes from being the idiot person who could never remember to apply it twice a day - mostly I just applied it once a day in the morning. The serum is super light and a little goes a long way - two drops covered the whole bottom half of my face - it also doesn't absorb super quickly so to give it a chance to sink in, I apply the serum and go and do something for a few minutes and then come back to apply moisturizer on top of it. Even though I have been lax in the suggested twice a day application I have noticed a definite thinning of hair - I figure once I have used it once a day for 16 weeks it will be the same as if I had used it twice a day for 8 weeks and I'll have my optimal results!